CULTURE: Needs loose, well drained, organic soil. Light colored, low growing, ground spreader. Drought tolerant. USES: Ground cover, antiseptic and styptic, teas. PROBLEMS: Too much water, poorly drained soil. Develops crown rot if kept too wet. NOTES: Propagates and spreads easily by seeds and rhizomes. Cut back the flower spikes to maintain compact appearance. Flowers are good in dried arrangements. 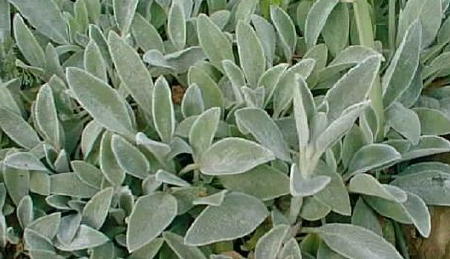 This is a hardy plant with felt-like white leaves as soft as a lamb’s ear. It must be grown in dry, sunny conditions. Hard rains beat it down and turn it mushy.